Quick: What has six arms, three heads, one pair of glasses, and zero chance of getting an even break? If you replied the Doors without Jim Morrison, then you've probably read at least some of the many reviews panning Other Voices and Full Circle. Both were recorded and released following the Lizard King's July '71 shedding of his Earthly skin, both have long been dismissed by the band and critics, and yes, both are wildly uneven affairs offering testimony as to why Ray Manzarek replied "musician….organist" rather than "vocalist" when asked his profession in The Doors Documentary. No, neither of these works will ever be mistaken for a classic, but both do contain a handful of sturdy songs -- not to mention some of the Doors best ever ensemble playing. Forty years have passed - why not have another listen? Essentially the material the band was rehearsing in the wake of LA Woman while Morrison prowled the Seine, Other Voices was rushed out by Elektra in October of 1971 most likely to cash in on the singer's death. "In the Eye of the Sun" begins like a mutant cousin of "I Heard it Through the Grapevine" filtered through Tom Waits's "Big in Japan". For a moment, it seems the bad news from Paris was just a hoax. Manzarek's electric piano, John Densmore's sure beat, and Robby Krieger's nimble fingers sound like old times. The only thing missing is a bit of that eat mo' chicken, honk konk konk from you know who. Of course, the honk konk konk never arrives. Manzarek's voice isn't terrible so much as bland (not to mention often pitchy), and that just won't cut it on a track Morrison would've turned into hard cider. He can't be replaced, and on the next track, Krieger says don't bother trying. His "Variety is the Spice of Life" sounds virtually nothing like The Doors, but its easy-rolling "aw…shucks" vibe (kind of a turbocharged JJ Cale) does offer a viable new course for the post-Jimus era. Given the reins, Krieger (always the band's crack songwriter) might've provided a more coherent if limited musical direction. More democratic winds prevailed, however, and thus we get Manzarek warbling on "Ship's with Sails" and the rocking but pedestrian "Tightrope Ride" (an obvious homage to Morrison with Brian Jones standing in as the doomed rock star). Krieger steps up with another witty, blowin' down the road charmer in "I'm Horny, I'm Stoned" (No, it's not a Morrison poem set to music) but ill-advisedly hands the microphone to Ray for his "Wandering Musician", an otherwise fine Stonesy ballad with weak vocals. "Down on the Farm" (again penned by Krieger) is the record's standout track. Written for LA Woman but nixed by Morrison, it boasts one of Krieger's sweetest melodies (Think Gram Parsons had The Beatles signed him to Apple) and an off-centre Band-like arrangement. Krieger and Manzarek's voices actually blend rather well here; one wishes they'd done more harmonising throughout the record. As on previous albums, the boys go for the Big Closing Statement, but the Latin-tinged "Hang on to Your Life" falls flat mostly due to lyrics like "Life is like the wind / Where does it begin?" and again lacklustre vocals. 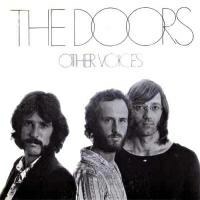 After a round of touring, the three Doors, down but not out, released Full Circle in August of 1972. Out was producer Bruce Botnick and in were numerous session musicians. Full Circle shows the Doors intent on a sunnier, more upbeat approach. Manzarek's "Get Up and Dance" opens things in full early 1970s boogie mode. Obviously intended as the album's Big Hit Single, the song is well-performed, somewhat catchy, and totally anonymous (It went to number 84 in the UK charts). Krieger's "4 Billion Souls" and the JJ Cale influenced "It Slipped My Mind" carry on in the vein of Other Voices but are less interesting. The best moments on Full Circle come when The Doors and their cohorts stretch out and play. "Verdilac" features a bad funk-jazz groove, some nice sax blowing by Charles Lloyd, along with Robbie, Ray, and John at their tightest. One of the best things they laid down post-Morrison, its only competition here is Krieger's "The Mosquito". No early subscriber to the PC movement, Krieger sings "No me moleste mosquito/let me eat my burrito…" before breaking into the guitar equivalent of a giant can of Raid. His extended solo here absolutely burns. As for the rest of the record…well, we get Manzarek's best-ever vocal on "Hardwood Floor", the Curtis Mayfield flavoured "The Piano Bird" (so-so vocals again - what did these three musos have against doing an instrumental? ), and a filler version of "Good Rocking Tonight". Sadly, they save the worst for last. The just slightly dated "The Peking King and the New York Queen" is a water-logged Manzarek parable about Nixon's then current trip to China and East-West rapprochement. The less said about it the better. Following Full Circle, The Doors intended to visit England in the hope of finding a new singer. Before that could happen, however, a disillusioned Ray Manzarek packed it in and one of America's greatest bands was no more. Largely forgotten today, Other Voices and Full Circle were the more often than not flawed but occasionally inspired final statements from what remained of that band.